Unfortunately, the beauty of this species may be its downfall. They are already for sale, and collected in large numbers, in the pet trade. And since the species is new to science, we know almost nothing about its basic biology. Astacologist Chris Lukhaup mentioned on his Facebook page that he’s spent over a decade working on the description of this gorgeous new species. They aren’t all this pretty; there are a couple of different morphs, and no doubt Chris’s considerable photographic talents are at play in this picture, too. Update, 13 May 2015: This crayfish is featured in this New Scientist article. Warning: contains me. 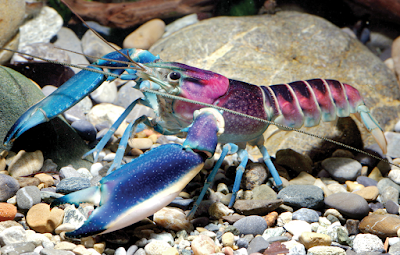 Update, 15 May 2015: It’s so nice to see crayfish in the news, and attention being drawn to the potential dangers of exploiting an almost unknown species for the pet trade. This article in the Washington Post says the species looks like a Lisa Frank creation... wait, did they steal Jason Goldman’s joke?